ESYNiC HDMI Extender delivers 1080P HDMI signal up to 60m over single CAT6 network cable, with one more loop-through HDMI output on TX, supports connecting to a HDTV and you also can connect to the local side at the same time. 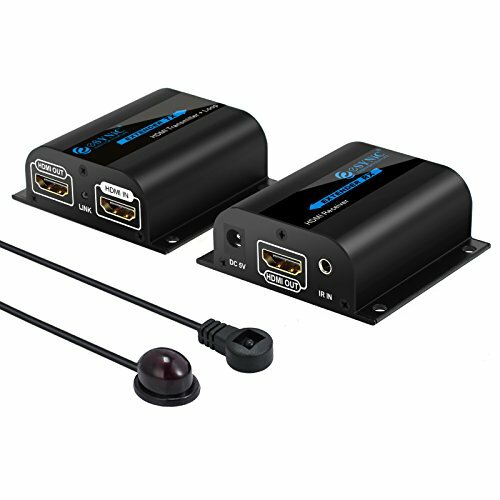 【1X2 HDMI Extender】HDMI Extender with 2 Port HDMI Splitter, Supports Connecting to a HDTV and You Also can Connect to the Local Side at the Same Time. 【Up to 200ft/60m Transmission】Converts HDMI Signal to Standard Network Signal and Transferred by CAT5e/6 Cable up to 60m, Adjust the Specifications Automatically for Different Cable Length 1-60m to Achieve the Best Display. 【Full HD 1080P Solution】Transmit HDMI HDCP HDTV HD Solution up to 1920x1080P, Support for 1080p@50/60Hz, 1080i@50/60Hz, 720p@50/60Hz, 576p@50Hz, 576i@50Hz, 480p@60Hz, 480i@60Hz, Give You a New Vision. 【IR Signal Transmission】Allow Source Device to Recognize Remote Commands, and You can Control the Source Device at a Secondary Location.